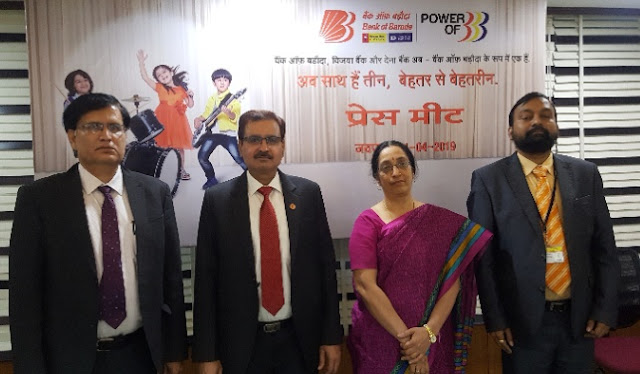 Jaipur : From April 1st, 2019, the amalgamation of Bank of Baroda, Vijaya Bank and Dena Bank comes into effect to create India’s second largest public sector bank. Since the time, the ‘in-principle’ approval to the amalgamation was granted by the boards of the three banks in end-September 2018, the process has been completed in record time. The consolidated bank will be the second largest public sector bank in the country. It will have a wider geographical reach with more then 9.5k branches, 13.4k ATMs, 85k employees serving 120 million customers and business mix of INR 15 lakh crore with deposits and advances of INR 8.75 lakh crore, and INR 6.25 lakh crore, respectively. Commenting on the occasion, P.S. Jayakumar, MD & CEO, Bank of Baroda, said, “We are extremely pleased that Bank of Baroda, Vijaya Bank and Dena Bank are coming together to create the second largest bank in terms of network and customer base. We would work for the success of amalgamation by effective execution of all the activities to build a stronger organization and collectively deliver more to the stake holders than that of sum of individual entities." He further added that, "The diverse bouquet of products from the three banks, substantial investments made in technology and Centre of Excellence on Analytics & AI and Technology will help in benefiting a wider customer base. The customers of Dena Bank will be able to avail credit facilities immediately. We would use this unique opportunity to leverage upon the rich legacy of three banks to build a modern and world-class banking institution for our customers, employees, partners, and other stakeholders."